Thanks for visiting. Our website began July 20, 1996 . It is our plan to continually update this page with information that will run the gamut from scientific information to personal interest for those who follow what goes on in the world of Cognitive Therapy. We welcome your comments and suggestions. Credibility in information, reputation, and training credentials are essential for professionals who seek further continuing education. Be aware there are many fraudulent organizations offering certificates or "grandfathered" credentials. Use caution when considering some of the offerings available on the Internet and by mail, and check with your national professional organizations before sending money to organizations with names similar to credible establishments. Atlanta Center for Cognitive Therapy is approved by the American Psychological Association (APA) to offer continuing education for psychologists to sponsor continuing education for psychologists. ACCT maintains responsibility for this program and its content. Atlanta Center for Cognitive Therapy has been approved by NBCC as an Approved Continuing Education Provider, ACEP. Programs that do not qualify for NBCC credit are clearly identified. Atlanta Center for Cognitive Therapy is solely responsible for all aspects of the programs. Atlanta Center for Cognitive Therapy is solely responsible for all aspects of the programs. ACCT complies with the rules of the Georgia Composite Board of Professional Social Workers, Psychiatric Nurses, Psychiatry, Pastoral Counseling, and Marriage & Family Therapists. For those outside of Georgia, ACCT is not responsible for how your state licensing board determines the application of these hours to your license. We advise you to call your licensing board if you have questions about how your professional licensing board will determine the type of credit you receive. Please send an inquiry if you would like us to email you a brochure and registration information for any of our CE programs. This is our largest and most successful training opportunity. Upon completion of The Cognitive Therapy Certification and Training Program, 70 CE hours are awarded. ACCT is approved by American Psychological Association (APA) to offer CEs for psychologists and Atlanta Center for Cognitive Therapy has been approved by NBCC as an Approved Continuing Education Provider, ACEP No. 5674. Programs that do not qualify for NBCC credit are clearly identified. Atlanta Center for Cognitive Therapy is solely responsible for all aspects of the programs. ACCT maintains responsibility for the program. The Cognitive Therapy Certification and Training Program was originally designed in 1985 by two psychologists, Arthur Freeman, Ph.D., and Mark Gilson, Ph.D. Dr. Freeman has served as the training director of The Center for Cognitive Therapy, University of Pennsylvania, Chair of the Department of Psychology, Philadelphia College of Osteopathic Medicine, and has authored over 40 books on contemporary mental health treatments. Dr. Gilson, is the founder and Director of Training for ACCT, has authored several treatment manuals and patient workbooks on Cognitive Therapy, and has served as faculty at the University of Pennsylvania. He has also served as adjunct faculty at Emory University Department of Psychiatry and Georgia State University Psychology Department. Our new Directors in 2018 are Charlie Davidson, Ph.D., Scott Greenaway, Ph.D. and Daniel Shapiro, Ph.D.
Over the years, the program has employed the services of notable clinicians and researchers, such as David Barlow, Aaron T. Beck, David Burns, David Clark, Edna Foa, Don Meichenbaum, John T. Watkins, Jeff Young and others. Almost all of the workshops presented were recorded in their entirety and cover a wide range of clinical concerns. There are two versions of the program: 1.) Live Attendance and 2.) Self Study. The Live Attendance version is completed in 9 months, whereas the Self Study depends on the participant. Both versions of the program include four discrete sections of one program. Section 1, Fundamentals, provides an overview of the theoretical basis and practice of Cognitive Behavioral Therapy. Section 1 includes presentations by faculty, reading, and passing an exam. Section 2, Application, demonstrates how CBT theory and techniques are applied in the treatment of depression, anxiety disorders (phobias, OCD, etc. ), and others. Speakers vary from year to year but have included Arthur Freeman, Ph.D., David Burns, M.D., Mark Gilson, Ph.D., Don Meichenbaum, Ph.D., and others. Section 3, Case Consultation, has participants present ongoing cases and includes small group consultation. Self-study participants will fulfill this requirement through telephone consultation with a trained psychologist. Section 4, Special Topics Paper, is the final section of the certification program. The area of focus will be determined by the special interests and needs of the participant. Submission of a five-page paper, addressing a clinical application of Cognitive Therapy is required. The entire program costs $1500, and there is an addition $50 registration fee. A payment plan for 3 payments of $550. is also possible. Payments are divided over a 9 month period. 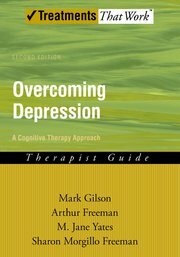 by Mark Gilson, Ph.D. and Arthur Freeman, Ph.D.
Five APA-approved CE hours are offered to clinicians upon ordering both the Client Workbook and Therapist Guide and passing a short quiz. If interested, call (800) 451-7556 or email ACCT to get your CE kit before ordering the book (You can only receive CEs if you order the book through ACCT). Aaron Beck, Albert Ellis, and others on Amazon.com and Barnes & Noble.com! This advanced program is for those who have documented training and experience using the Cognitive-Behavioral model of treatment in their clinical work. Professionals who have been trained as Cognitive therapists at a recognized program (such as ACCT) or university are eligible for this training and supervision opportunity. Mark Gilson, Ph.D. , John T. Watkins, Ph.D. and Arthur Freeman, Ed.D., coordinate the program which consists of eight telephone meetings that can begin once accepted. Participants will discuss cases and be given reading and written assignments tailored to their individual needs. Case consultation will consist of one-on-one telephone appointments or face to face if you live in or near the Atlanta Area. Individual, group, and telephone clinical supervision are available for professionals who already have a background in Cognitive Behavioral Therapy. The cost is $70.00 per hour, and CE credits are assigned. Guest Faculty are again being scheduled. We have featured lecturers such as David Barlow, Ph.D., Aaron T. Beck, M.D., David Burns, M.D., Marlene Maheu, Ph.D., David Clark, D.Phil., Don Meichenbaum, Ph.D., Myrna Weissman, Ph.D., Arthur Freeman, Ed.D., Jeffery Young, Ph.D., and others. We now coordinate our programs with IAHB (IAHB.org). See our News & Information page for links to newest upcoming workshops. Note: The following DVD presentations are temporarily unavailable. Videotaped/DVD presentations are 5-10 hours long and allow you, the mental health professional, to see and hear the workshops. We believe this promotes more involvement in learning and understanding than most audiotaped lectures. Plus, you choose the times you wish to participate. Our programs are not directed by George Lucas or Steven Spielberg and use a single camera to record. They are unedited with all useful content intact along with the occasional extraneous events that occur at workshops. They have limited distribution and do not compete with documentary and professional film presentations and will never win prizes on artistic/aesthetic merits. They are not part of APA approved CE program for certification. written and presented by Arthur Freeman, Ph.D. In this recorded workshop, Dr. Freeman discusses and highlights his book of the same name. Any participant purchasing this DVD will receive a free copy of the book. Click here to be connected to Amazon.com, to view the book. 12 CE credits are contingent upon viewing the DVD, reading the book Woulda, Shoulda, Coulda, and completing an exam within 90 days of receiving the materials. I. What is Woulda, Coulda, Shoulda Thinking ? b. How does it affect our lives? c. Can we fight it? d. What will happen if we put it aside? e. How does thinking set us up for success or failure? a. Common mistakes of thinking. e. Why do fools fall in love? Presented by Donald Meichenbaum, Ph.D. Presented by Marlene Maheu, Ph.D., publisher of Psychology & Self Help Internet Magazine. Learn the new legislation for medicine and psychotherapeutic services you must adapt to and more. Dr. Maheu makes the tough stuff easy to understand and has information that will enhance the way you adapt to the new methods of making therapy and your practice work. Be a step (or even a flight of stairs) ahead! Presented by Arthur Freeman, PH.D.
Arthur Freeman is the former president of The Association for the Advancement of Behavior Therapy and author of over 40 books in the past 30 years. He is a powerhouse presenter who travels the globe to teach new methods of empirically validated therapies. The demand for accountability in solution focused, short term treatment demands that private practitioners and institutions present a coherent approach to psychotherapy. Art will show you how and help you complete a treatment manual that will improve your practice or clinic in one day. This presentation has the highest feedback ratings from participants who attended.